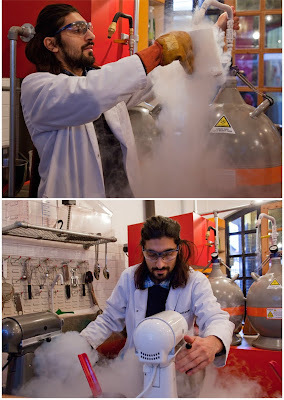 The scientist will produce an ice-cream of silken texture with Madagascar vanilla or valrhona chocolate. From liquid to cream in seconds. Topped with caramel, honeycomb, nuts, blueberries or other delicious things. The nitro ice-cream parlour is in Camden Market. Very cool. Wow! The "ice-cream heaven" is in London! Wow, but is it safe? Oh. I want one. And I want it now. Great images, and I could do with an icecream just now. This does look like something to see....and eat of course. Cool post. And so yummy. I think I will add it to my list of places to go next time in London! Has a bit of the feel of a mad scientist's laboratory. Cool photos and techniques he has going on there.